Directions: Questions 3 to 4 are based on the following data. 1. 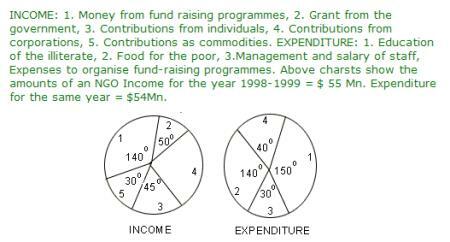 According to the graph, which of the following is the best estimate of the total revenue from government funding in 1990? 3. If the government stops the grant and the expenditure pattern remains the same, then what will be the decrease in the money spent for the education of illiterate? 4. How much money is raised by fund raising programmes? 5. For which state the average number of candidates selected over the years is the maximum? 6. The percentage of candidates qualified from Punjab over those appeared from Punjab is highestin the year? 7. In the year 1997, which state had the lowest percentage of candidates selected over the candidates appeared? 8. The number of candidates selected from Haryana during the period under review is approximately what percent of the number selected from Delhi during this period? 9. The percentage of candidates selected from U.P over those qualified from U.P is highest in the year?